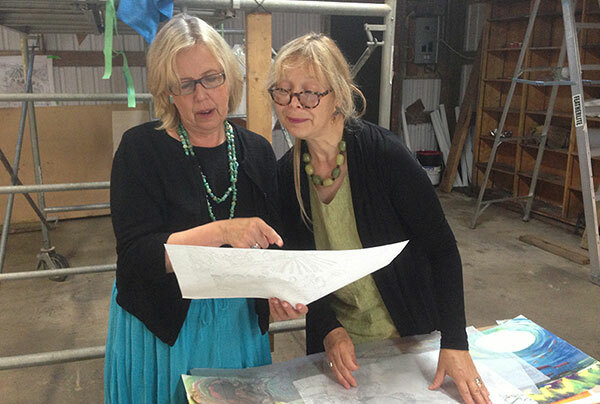 August 2014 – Judy Baca visits the team of the Canadian Panel in their studio. The ravens are calling overhead as we rest under a Canadian maple tree from our morning’s work installing the new 10ft x 30ft panel of the World Wall in a tractor barn on Mayne Island in the Southern Gulf Islands of British Columbia. It will be the ninth mural in the series begun in the height of the Cold War. The working title of the Canadian work is “The Inuit Send the World a Canary”, inspired by Sheila Watt-Cloutier who brought international attention to the spectra of global warming changes in the north several years ago at a circumpolar conference. Inuit elders spoke of seeing new insects for which they had no names, as the warming climate spreads their habitats north. Today, at latitudes where climate warming effects appear to be most accelerated, there is less arctic ice than ever in history, seriously diminishing the reflection of solar heat back into space and changing the distribution and movements of polar bear and marine mammals such that the natural ecological systems the Inuit depend on for their way of life are being irrevocably altered. Designed by artist Tania Godoroja Pearse, the mural speaks to the issues of both global warming and rapacious exploitation of natural resources, and their profound and uncontrolled destruction of Canadian life and landscape. Rampant nonrenewable resource development in the form of mining, oil sands and shale gas extraction, along with leaking oil and gas pipelines crisscrossing our waterways and lands like a web of bleeding arteries, continue to threaten our collective ways of living and our natural systems upon which we all depend. Tania explains the work: The central image is the salmon which is the symbol of interconnectedness between water, land, animal life and humans. The salmon is cultural keystone of West Coast First Nation peoples’ culture, art, and way of life. Its mythical cycle has been part of their lives since time immemorial. Mines and pipelines threaten to change these ways of being, irreparably. Not only are fish habitats threatened but so also is the basic human right to fresh water. Along the salmon spawning route are fish farms that further add to the demise of a major food source. One of the images in the Canadian panel is Teztan Biny, otherwise known as Fish Lake. 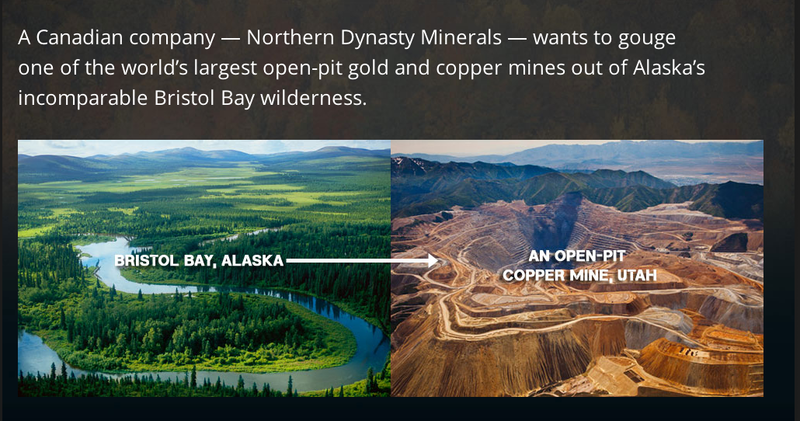 A huge open pit copper-gold mine is proposed for this area, which would destroy much of the watershed and an important cultural landscape for the Tsilhqot’in people of central British Columbia. 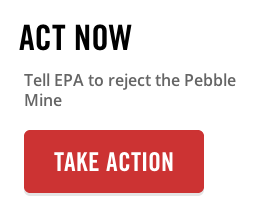 The lake is currently and precariously balanced between a slide into irreversible destruction or a securing of its protection forever as a federal review panel considers the mine proposal. At the top of the Canadian mural, and slightly to the left of center, is a representation of Teztan Biny (Fish Lake) located in the Chilcotin Plateau region of central British Columbia. This area is the traditional home of the Tsilhqot’in people, and they are currently fighting the Canadian government in the Supreme Court to have their aboriginal title and rights in the territory recognized. Teztan Biny is an important cultural heritage site for the Tsilhqot’in, and has been recognized as a ‘cultural keystone place’ by anthropologists. 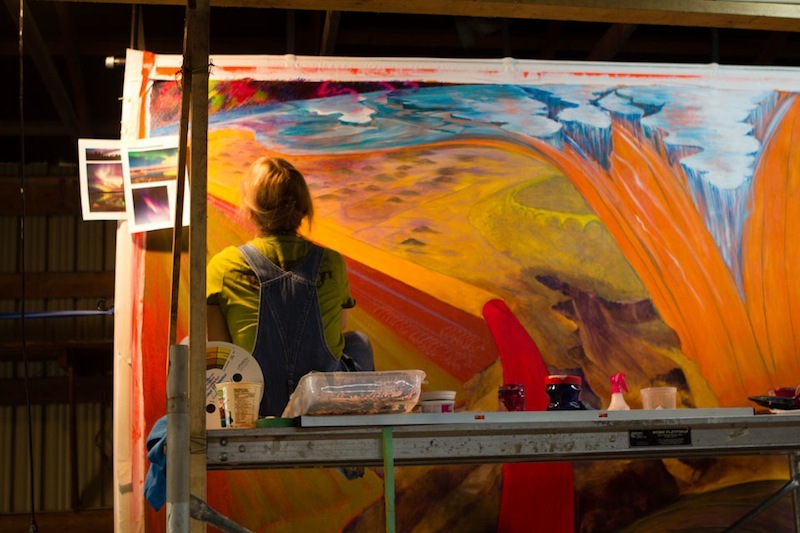 As the mural is being painted, Teztan Biny is facing a second proposal from a Canadian mining company Taseko Mines wanting to construct what could be Canada’s largest open pit copper and gold mine. An earlier proposal by Taseko to drain the lake and use it for storing waste rock was rejected by the federal government in 2010. Taseko has now reconfigured the mine plan to avoid disturbing the lake, promising to mine around the lake and keep the lake itself intact as a functioning ecosystem in perpetuity by recirculating the outflow of the lake to small feeder streams upstream of the lake. A second federal review panel is now looking at this proposal. A number of expert technical people from the federal government departments, provincial government departments and the Tsilhqot’in National Government have all presented evidence to the review panel that seriously questions the work done by the company to support its case, and identifies numerous uncertainties and risks that the proposal poses. The Tsilhqot’in National Government presented evidence from eight pre-eminent experts on various parts of the company’s proposed plan. One of these was the great Canadian limnologist, Dr. John Stockner, who told the panel that if the project proceeds the lake will be dead to fish within 10 years. Listen to The Oral Testimony to Federal Review Panel of Dr John Stockner, Canadian limnologist, about what will happen to Fish Lake if the New Prosperity mine proceeds. The review panel will present its final report to the federal environment minister about the end of October, and a decision about the fate of Teztan Biny will come some time after that. The Tsilhqot’in struggle for Teztan Biny has been chosen for the mural because it represents the pervasive struggle throughout Canada, indeed the world, between the original indigenous inhabitants of ancient, stewarded landscapes and the rapacious appetites of the corporate capitalist enterprise which can profitably turn the resources of these territories into a bankable profit in some other part of the world. The result of this commodification and plundering of indigenous territories, with the concomitant long-term impoverishment of the resident cultures, is the creation of a biophysical and spiritual wasteland that poses extreme challenges to the inhabitants to overcome and co-exist in a meaningful and voluntary way as a people within the Canadian federation. It is a legacy that continues to oppress vast numbers of the country’s citizens, and to pull us all down into the mire of global contempt and humiliation. This dilemma for Canada of reconciling its outdated colonialist policies with the aspirations and cultural needs of its disparate aboriginal inhabitants throughout the country remain its single greatest obstacle for achieving the reality of a Canadian future that is just, honorable, and without fear. As a result, Teztan Biny remains poised in the mural on the balancing point between, on the one hand, the slide into the maw of a rapacious capitalist hunger that will transform it into a cultural and ecological wasteland and, on the other, the crystallizing of a sustainable future that gives life and meaning to the Tsilhqot’in and their future generations. Explores the material and spiritual transformation of an international society seeking peace. During the early stages of the production of this mural Baca read Jonathan Schell’s Fate of the Earth, which argues that we must imagine the eventuality of nuclear war before we can change our destiny. She realized however, that in addition to being able to imagine nuclear destruction, we must also be able to imagine peace, particularly as an active rather than passive concept. The eight 10’ by 30’ panels arranged in a circle that make up The World Wall attempt such imagining. The WORLD WALL is the next logical step for my large-scale public art work. For the past ten years I have been working on a narrative mural called the “Great Wall of Los Angeles.” Comprising the little-known history of California’s ethnic people through the 1950s, it has grown segment by segment to a half-mile length. With this work, a model production process emerged that parallels the visual content. By assessing the socio-political and cultural nature of the work, as well as the more usual aesthetic concerns, I face a series of problems to solve. Their solutions will ensure the success of the work, i.e., a true integration into its environment. In the case of the “Great Wall,” an overriding social issue was the history of inter-racial struggle between adolescent youths who frequented the site. Multi-cultural youth teams assisting in the production of the work and focusing on the roots of racial conflicts were empowered to propose solutions both visually in wall imagery and in actuality through the establishment of interpersonal communications. A few years ago many of us read Jonathon Schell’s Fate of the Earth, in which he said that we must imagine the eventuality of nuclear war before we can change our destiny. It occurred to me later that it was not imagining destruction that was so hard to us but rather imagining peace. One of the students on the WORLD WALL team said, “Is peace everyone sitting around watching TV?’ If we cannot imagine peace as an active concept, how can we ever hope for it to happen? The WORLD WALL takes the successful principles developed and refined in the “Great Wall of Los Angeles” and applies them to international communication. This time I have worked with a global team of 45 students and artists to conceptualize “A Vision of the Future Without Fear.” “Great Wall” workshops and brainstorming techniques were employed to develop the proposed content. 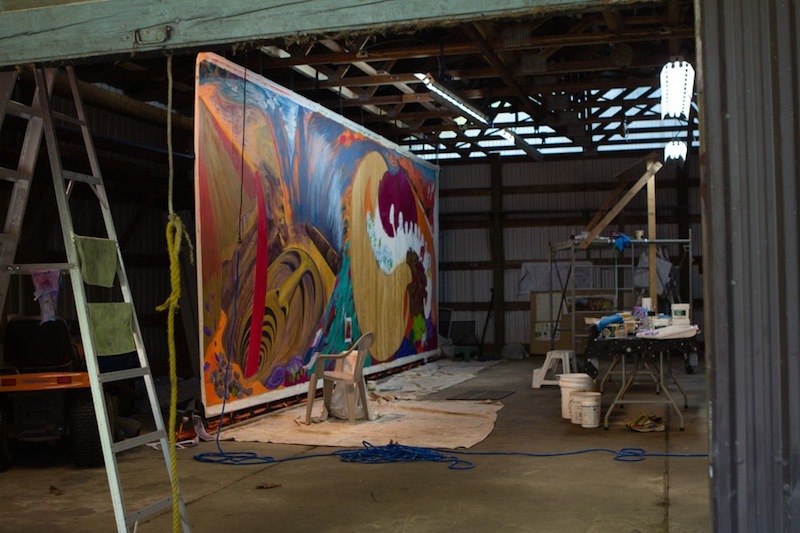 As a result of these workshops, I developed the concept of a portable mural composed of seven panels, 10′ x 30′ each, that would assemble into a 100-foot diameter circle. This system can be installed anywhere in the world and is viewed 360 degrees by an audience both standing in its center, as well as around its outer surface. The WORLD WALL premiered in June 1990 in Joensuu, Finland at “A Meeting of the Worlds,” where Finnish artists joined the project and produced the first of a series of international panels that convey their own “Vision of the Future Without Fear.” Then it traveled to Moscow, USSR, where it was exhibited for one week in Gorky Park, and Alexi Begov, a native Russian artist, added another panel. The WORLD WALL will travel to and be exhibited in many countries, along the way inspiring activist artists all over the world to play a visionary role in imagining a peaceful future for us all, their own “Vision of the Future Without Fear.” This project, therefore, offers artists the opportunity to actively inspire individuals with bold and imaginative works that describe a peaceful society in terms that are challenging and striking, and that are well-grounded in the possible. If we speak in a language that is comprehensible and believable people will listen. The WORLD WALL premiered in June 1990 in Joensuu, Finland at “A Meeting of the Worlds,” where Finnish artists joined the project and produced the first of a series of international panels which convey their own “Vision of the Future Without Fear.” Then it traveled to Moscow, USSR, where it was exhibited for one week in Gorky Park, and Alexi Begov, a native Russian artist, added another panel. The WORLD WALL will travel to and be exhibited in many countries and along the way inspire activist artists all over the world to play a visionary role in imagining a peaceful future for us all, their own “Vision of the Future Without Fear”. This project, therefore, offers artists the opportunity to play an active role, to inspire individuals with bold and imaginative works that describe a peaceful society in terms that are challenging and striking and that are also well-grounded in the possible. If we speak in a language that is comprehensible and believable people will listen. The WORLD WALL has received major funding from the following organizations and individuals: The Women’s Foundation, National Endowment for the Arts, the California Arts Council, Liberty Hill, the Rockefeller Foundation, University of California Mexus, University of California, Irvine, ARCO, Wallace Annenberg, and Bill Alexander. Many other individuals have donated time and money to make this project possible. 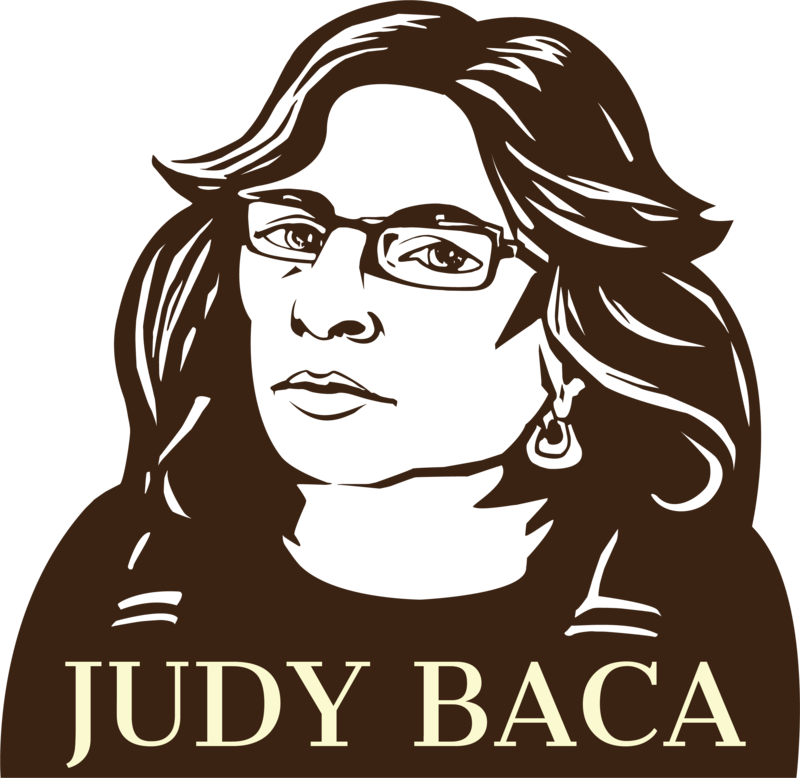 Assistants to Judith F. Baca on the WORLD WALL include Juan Burgueno, Regan Mc Neill, Yoko Nogami, Greg Pickens, Lilya Vorbey, and Matt Wuerker. Triumph of the Hearts depicts the beginning of any movement of a society towards peace: the individual taking action. To date four panels, Triumph of the Heart, Nonviolent Resistance, Balance, and Triumph of the Hands have been completed by artist Judith F. Baca. In addition four international panels have been added, Dialogue of Alternatives by Finnish artists Juha Saaski, Sirkka-Liisa Lonka and Aaro Matinlauri and The End of the Twentieth Century by Soviet artist Alexi Begov were added in the summer of 1990. The Israeli-Palestinian Panel by artists Ahmed Bweerat, Suliman Monsour and Adi Yekutieli were added in the spring of 1998. In 1999 the Mexican panel, “Tlazolteotl: Fuerza Creadora de lo No Tejido” was created by artists Martha Ramirez Oropeza and Patricia Quijano Ferrer. The WORLD WALL will premiere in Mexico at the Sixth Annual Mexico City Book Fair, October 6 – 15th. Each year, during the ten days of the fair the Zócalo (town square) and the surrounding historical district are transformed into venues that celebrate reading and culture. The event, organized by the offices of Dr. Raquel Sosa, Secretary of Culture for Mexico City, brings together one million people in more than six hundred activities. The Fair is a place for authors, intellectuals, artists, and educational and cultural institutions to compare experiences, debate possibilities, and establish a nexus for the production and dissemination of cultural projects. All activities are free and open to the general public. The Fair invites two cities to participate: this year Los Angeles and Havana are the invited guests. An artist’s walk will be created through the streets of the Historical District, with exhibitions of sculpture, murals, photography, installations, and graffiti on view. 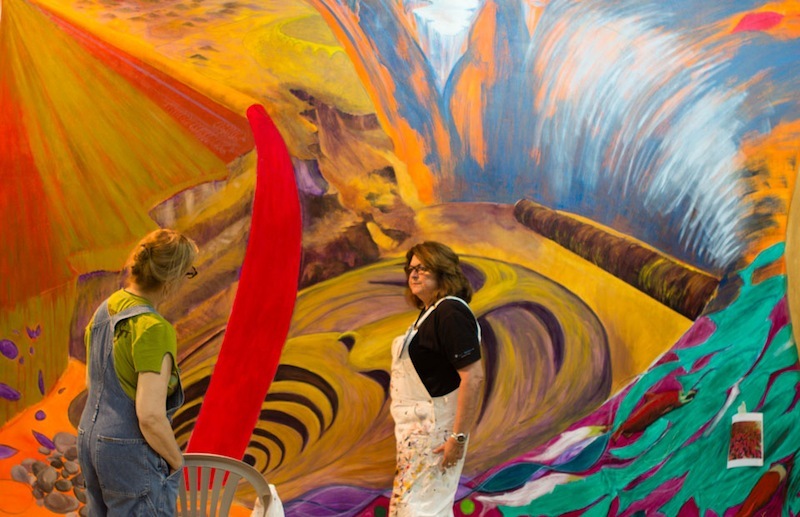 The Mexico City government invited Chicana artist, educator, SPARC Artistic Director and Co-founder Judith F. Baca, one of America’s leading muralists, to speak and exhibit the WORLD WALL at the fair. 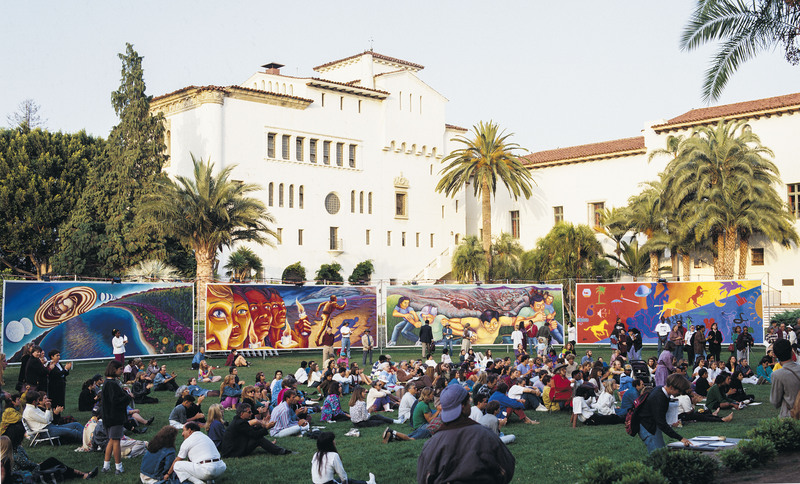 The WORLD WALL is a traveling installation mural, conceived by Chicana mural artist Judith F. Baca and coordinated by Social and Public Art Resource Center (SPARC), celebrating 30 years of community-based, participatory public arts projects. The WORLD WALL consists of eight 10 feet by 30 feet portable panels which envision a transformation from a war-based society to a peaceful one. Begov, a native Russian artist, with the assistance of Vladimir Jegolenkov painted The End of the Twentieth Century. The Palestinian-Israeli team consisting of Ahmed Bweerat, Suliman Monsour, and Adi Yekutieli painted Inheritance-Compromise. Two Mexican muralists, Martha Ramirez Oropeza and Patricia Quijano painted Tlazolteotl: Creative Force of the Un-Woven.